There are a couple of thing to know about Jute Bags when selecting them for your business, promotion or event. The growing & harvesting processes of Jute do not use much energy or water which means that the overall environmental footprint of Jute is one of the lowest when compared to other fabric options. Jute is a very raw material & does not go through the same milling & refining processes as other natural fibres (such as Cotton & Canvas). The finished product for Jute fibres is a course & rough finish, there are a few little Jute threads that can come away from the base fabric - it's only quite minor, but worth considering when choosing your fabric options. Jute as a very open-weave finish. It's quite easy to count the threads of Jute fabric with the naked eye. Whereas Cotton & Canvas have a much much tighter weave. Because of the open-weave finish of the Jute fabric, printing on Jute can look wonderful or terrible - this is totally dependent on the artwork to be reproduced. When printing on Jute, just imagine that your artwork could end up looking a bit pixilated (like pixilation that occurs on photo's on your computer screen). To be sure to eliminate any pixilation your artwork should have big, bold lettering & round edges as opposed to little tiny points & thin lines. Thin & tiny lines might end up disappearing all together. Get Artwork Assistance from us to be sure your design will work. Our Jute comes primarily from India. The usual delivery lead-time from the factory is about 12-14 weeks with a minimum order quantity of 1,000 units. 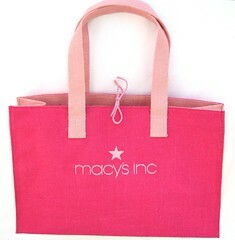 Because this lead-time is quite long we have taken to holding a variety of Jute Bags in stock. This short-circuits the lead-time & minimum quantities. Our stock is delivered within 10 days & has a minimum order quantity of 100 bags. 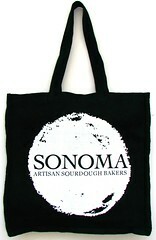 When looking for any bag to represent your business you need to ask the right questions to get the right result. Some options might be better suited to your needs than others, so be sure check out all the fabric options. 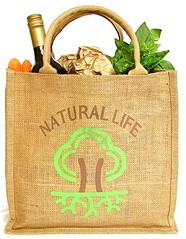 Jute is a favourite of ours & it is quickly becoming the "new black" in the bag world. Be sure to Contact Us if you'd like more info.